The Tampa Bay Rays will test their organizational pitching depth this week. Marc Topkin of the Tampa Bay Times reported that Jake Odorizzi will be recalled to start game two of Tuesday’s day-night doubleheader with the Boston Red Sox. Alex Colome will take Alex Cobb‘s turn in the rotation on Thursday. Odorizzi will be joined by former roommate Wil Myers who was recalled by Tampa Bay on Sunday and will start in right field for the Rays. Odorizzi as made two starts for Tampa Bay this season and appeared in one game as a reliever and has a 8.03 ERA across 12 innings of work, with 12 strikeouts and four walks. Colome made his debut against the Miami Marlins earlier this season and earned a 5-2 win, while pitching into the sixth inning. He struck out seven and walked two. Cobb is on the seven DL with a concussion after being hit in the head with a line drive off the bat of Eric Hosmer on Saturday. Right-hander Chris Archer will start game one and Jeremy Hellickson will start on Wednesday. 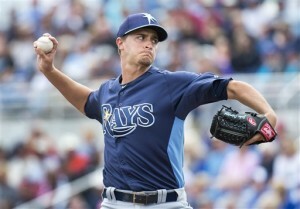 That means that the Rays have to find a starter for Thursday to replace right-hander Alex Cobb‘s turn in the rotation. that choice will likely be right-hander Alex Colome.